"DJ Bacon is one of Brisbane's best known and best loved DJ's. He began performing in the mid-1990's at some of the city's formative venues. Across 20 years in Melbourne and Brisbane, he has played at most of Australia's iconic club venues and events. He is a former QLD DMC DJ Champion and Qmusic Award winner. He is rightly famous in the Australian music underground for his effortless blend of Hip-Hop, Soul, and Funk from every era. DJ residencies across the country have included world-class venues, such as Laruche, Cloudland, Revolver (Melbourne,) First Floor, The Evelyn, E55, Kerbside, Lychee Lounge, X&Y Bar, Press Club, Bavarian Bier Cafe, Sake Restaurant, Rumpus Room, Brooklyn Standard, and more. 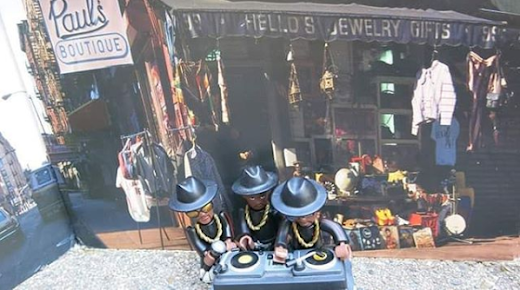 DJ supports of note have included all-time Hip-Hop pioneers, such as Grandmaster Flash, DJ Shadow, DJ Dexter, Cut Chemist, Jurassic 5, The Roots, and many more. With his band, Briztronix, he has won QLD Music Awards, released 3 full-length LP's, and appeared on dozens of compilation CD's and vinyl." I. So, I HAVE to know: how in the world did you ever get your DJ name, DJ Bacon? Everyone loves the name. Even vegetarians. I just had to own it and i have. It goes back to when I was in my teens and bacon sandwiches were like a religious experience for crushing hangovers. My mate, Goo, said I should call myself "DJ Bacon" 'cause I was always making bacon sandwiches for us because we were always hungover. I thought it was hilarious and stuck with it... that was around '94. I don't take myself too seriously; I'm not like DJ Lethal or DJ Killer B—just DJ Bacon! II. How did you first get into Hip-Hop/Rap and what exactly made you decide to start mashing up, remixing, and blending together your favorite artists? I got into Hip-Hop in '86 when I first heard "Walk This Way" on a compilation, Greatest Summer Hits-type deal. I had a mate, Mark Nair (RIP) who had a mate that he dubbed the Raising Hell cassette from and I remembered how much I loved "Walk This Way," so I copped the album myself. This was the coolest music I'd ever heard—particularly, growing up in Australia and having zero exposure to Hip-Hop on the radio. I started collecting Rap records from this point—all the Def Jam releases, plus, DJ Jazzy Jeff & The Fresh Prince, The Fat Boys, Ice-T, some early Breakdance/Electro compilations, and Run-D.M.C. religiously—they were #1. I got every piece of their stuff on every format I could find, which was difficult in Brisbane pre-Internet. I started making pause mixtapes for my friends on this very primitive 3-in-1 stereo my dad had that would let me actually play the CD and phono channels at the same time—I think because it was so dodgy... but it was cool I could play an [instrumental] on vinyl and put some spoken word or something similar over the top; that was like '94ish that I started giving close mates these really bad tapes. I never even knew what a DJ mixer was then. I wondered how Terminator X and [Jam Master] Jay and all these guys would repeat the sound sometimes without the scratch sound.... My mate, Goo, hooked up with his neighbour, DJ Cybex, around the same time, who was and still is the illest Electro B-boy DJ legend. He gave us so many tapes and we went to his house and saw all the records and DJ mixer and he showed me how it all worked... I was already so into this stuff—this just catapulted me into like, "this is my deal now." III. About how many songs do you typically sample/incorporate into a track such as your AC/DC & Run-D.M.C. blending "Back In Hell" Mega-mix? For the "Back In Hell" Mega-mix I used literally just the two records Back In [Black] and Raising Hell—all vinyl. If you know these albums well, you will notice a piece of each song from both albums in the mix—sometimes, a tiny drum fill—other times, a loop or a whole acapella... I did have to use the "Walk This Way" and "My Adidas" [acapellas] from digital, as I couldn't find them on wax. Previous to this mix, the mega-mixes I made used an artist's whole catalougue, so for the "RUN-BST" mix, I'd say over 150 samples from the two bands, Run-D.M.C. & Beastie Boys, that I used. IV. What's the difference between your "Back In Hell" Mega-mix and recently re-released "Back In Hell" (7" Black Adidas Edit)? Also, congrats on your first 7-inch! Oh, thanks, yeah... the 7-inch version is only 3 minutes and 30 seconds [long]. I just looped an instrumental section and made it the outro to cut it to 3:30. So, it's like the first part, you could say... the full mix is over 7 minutes. V. How exactly are your "RUN-BST" (Run-D.M.C./Beastie Boys) and it's "sequel," "Fear of An O.G." (Public Enemy/Ice-T) mega-mixes sonically related to each other? I used a similar formula: keeping the music in key and making the samples rhyme... but, I think, the production on a lot of Hip-Hop from '88-92 is already incredible—I would just try different loops over each other and try to see what worked. They were both mastered by my mate, Chris Stevens. I'm by no means technical when it comes to sound and frequencies, etc. I just trust my ears, but Chris may have a better answer. VI. On the heels of Ad-Rock & Mike D-penned BEASTIE BOYS BOOK, would you mind briefly discussing your "Sure Shot" (Rock Steady Remix) and "Shake Your Rump" (DJ BACON 80'S RAP MEGA-MIX)? I'm really only just getting into remixing... I prefer the tough slog of the mega-mix and really pushing the limits. The "Sure Shot" Remix took me an hour—I put it on Bandcamp and people really liked it... now, it's on the 7-inch and DJ's are playing it. I walked past a DJ yesterday playing it. I just love the Beastie Boys so much that it's always fun for me to use their music 'cause it makes me feel young and I get excited about music, when using their stuff. The 80'S RAP REMIX is more of a conceptual remix trying to fit a lot of dope loops into the one song... I really like it, but need to keep working on the mix of it—the 808 kick is killing stereos and annoying Chris, my mastering guy... not unlike the Beastie Boys tale in the book about the "Hold It Now, Hit It" 808 kick... however, I should point out: I made this remix well before the book's release. VII. Now, I know Briztronix's first album in 11 years, Briztronix IV, was released just this past September... but so yourself, Ben Eltham & RUFFLES have any immediate plans for "Briztronix V" ? Well, we haven't really given this new release, IV, a proper push yet. I think 10 years in the wilderness, we are just throwing it out there now to see what reaction we get, at the moment... I'm super proud of the record and all the work Ben and Kieran and I put in to make it sound like it does. I've listened to it about 500 times and [I'm] still not sick of it. All feedback has been positive, but I really think with how busy we are, it's difficult to promote an underground instrumental release that is firmly not aimed at the radio. It's destined to be a slept-on classic, though, mark my words. No immediate plans for V yet, but one of us is always putting something together; a beat or some synths or loops, so it's ever-evolving. VIII. What type of feedback have you received thus far from artists you've remixed, sampled, mega-mixed, etc.? Great feedback. I mean, there is a fine line between biting and homeage—I think, purely, with the amount of work I put into these mixes, they are embraced. I was always weird about putting images of other artists on my stuff, but when the artists themselves give you props, it makes it OK, I think. The best example of this is when I released an Ice-T/Public Enemy mash-up that I spent ages on... I Tweeted to Ice-T [@FINALLEVEL] to let him know and he straight Tweeted it to Chuck D [@MrChuckD] saying it's the hardest mash-up he's ever heard... so, I was completely stoked—I mean, the first gig I ever saw was PE & Ice-T, so these guys are literally my heroes. Getting a message from Ice-T, like "homie..." it's a trip. IX. For every project you've recorded and released, about how many ideas do you generally scrap? What specific criteria, in your opinion, is essential for a solid project base? The idea is everything. The execution is the fun easy part, but it must be a great concept... sure, I could go and do a Native Tongues mega-mix and it would be great and I could spend six months making that as intricate and funky as all Hell, but that's not an original idea. Mixing Run-D.M.C. & AC/DC together—trying to make those two completely different things the same—that's an idea... a rather time consuming one, but now, people are like, really, really, really enjoying that mix... the feedback has been incredible! Chuck D loves it and told all his Followers about it, for example. X. What else are you currently working on or preparing for imminent release? I'm going to drop another 45RPM 7-inch shortly... probably, in The New Year, but maybe sooner, but yeah, I need to tie up a couple loose ends for it and see if I have the capacity to make it happen this year or not. I'm literally spending a few hours everyday, at the moment, shipping vinyl all over the world from my room—my first 45 release from October is still going off in The UK and I've now nearly sold out of the second lot of 150—there might be about 40 left on my Bandcamp... so, it may not sound like lots of records, but when you pack, sign, post, sticker, and fill out customs forms for every one, then, line up at the post office and wait, etc. that sh*t takes a huge chunk out your day! I've been getting my kids to help put stickers on the records and they love it. PS: your copy is on the way, Matt. Posted that today. Thanks, my friend!